Background:I picked this up as a birthday present for my son John. Luckily he invited me down to share it with him. I really know nothing about this beer. It looked like a nice Belgian set with a glass so I picked it up. Let’s see what Ename is all about. Review:The bier pours a pale copper with yarrow/orange hues and a modest white head. The nose is nice with yeasty notes, some spice and citrus notes. There is a nice sweetness up front that leads into an interesting middle of the sip. 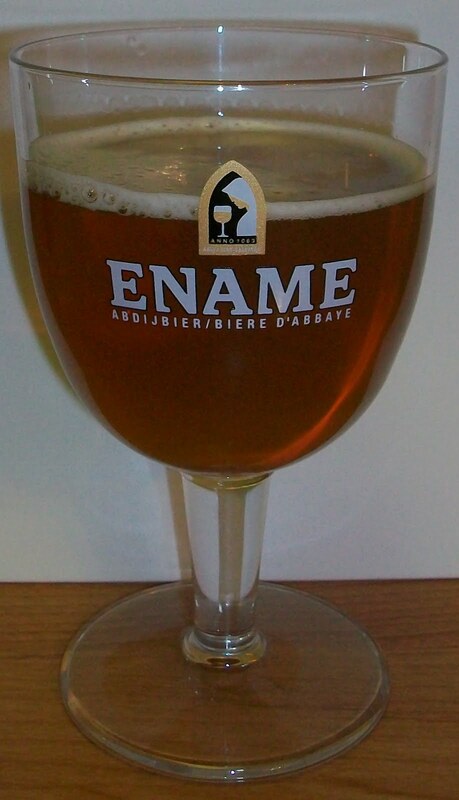 There is a more intense back-end than what is typical for a Belgian Tripel. This is not a smooth easy drinking Tripel. There is a really off taste on the finish with a mostly alcohol flavor on the finish and aftertaste. 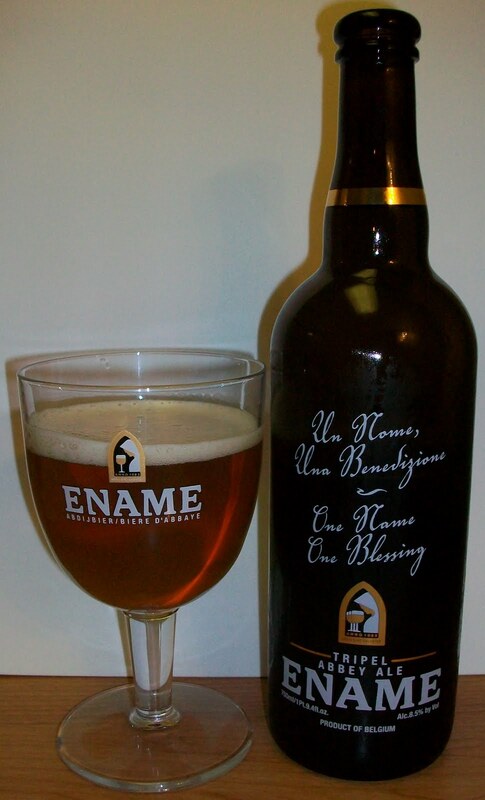 For a drinkable strong pale this is not too bad but for a Belgian Tripel it’s not very good. There is no complexity to this beer whatsoever. I have had Belgian pales with more complexity than this. It is a very bland beer with a strong alcohol finish. I’m beginning to suspect that this beer is past its prime or that it was mishandled. I don’t think I’ve had an authentic Belgian Tripel that was this bad before. Well, bad may not be the right word. This is not bad it’s just not a good Tripel. As this warms more maltier flavors are coming out so there is some development as the opens up a little. But there are no subtle esters and volatiles in this beer. It is pretty much one dimensional and that dimension is alcohol. I’m going to hold off on a rating for now. I’m going to get another bottle of this and compare it to this experience. Hopefully the new bottle will be better than this one.